"I’ve spent many years pursuing my passion for orthodontics. I know the positive effects it can have on a patient’s life and that is why I still enjoy coming into the office every day. Working with young people is the best way to stay young at heart!" Dr. Loucks is a native of Grinnell and graduated Phi Beta Kappa from Grinnell College with a degree in biology. He received his Doctorate of Dental Surgery (DDS) from the University of Iowa and was class valedictorian. He completed a full-time residency program at the University of Iowa and earned a Master of Science and a Certificate of Orthodontics. 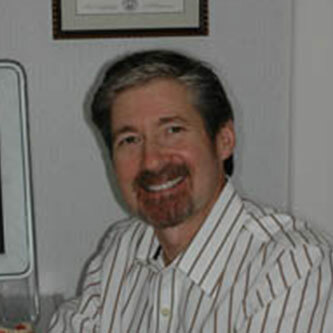 He has been practicing orthodontics in Newton and Grinnell since 1983. Dr. Loucks chose to remain near his hometown since he wanted to raise his family in the same kind of small-town community in which he grew up. He and his wife, Laura, were high school sweethearts and have three children: Jennifer, Ryan, and Spencer. They also have five grandchildren: William, Aven, Rowen, Samuel and Vaida. When not at work, Dr. Loucks loves spending time with his grandchildren, going to the movies, and Hawkeye football!